zarinahtakesapaycut: Tun Dr Ling Liong Sik may be innocent after all. With Chin Kwai Fatt looking into PKFZ, can anyone accept his findings as the absolute truth? e-invest.com reported that, "the PKFZ audit report said that the project cost has ballooned from RM1.957 billion to a staggering RM12.453 billion since the inception of the free-trade zone in 2001. According to the report prepared by PriceWaterhouse Coopers (PwC) - which was released today - the astronomical figure includes interest costs. The original estimated cost for the land purchase and development works in 2001 was RM1.957 billion... (the) project outlay has escalated to RM3.522 billion as at Dec 31, 2008. Accompanying Lee to the press conference today was auditors PriceWaterhouse Coopers (PwC) managing director Chin Kwai Fatt and PwC partner, Lim San Pin. The two were there to verify that the publicly released report was not tampered with and released in its entirety. Chin Kwai Fatt at the release of the PKFZ audit report. That the reader is not authorised to use or rely on the report to arrive at any conclusion. PwC has prepared the report for PKA. Their duty of care is only to PKA and PwC does not owe a duty of care to any other party. PwC is not obliged to respond to any queries." So what else is new then. 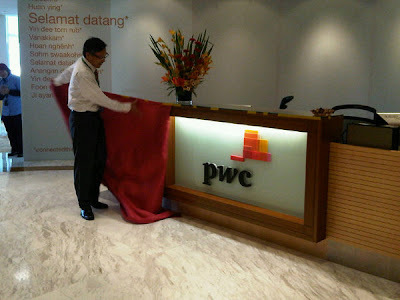 We have seen that PwC does not reply even if you tell them that the roof is on fire. 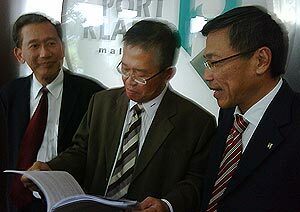 With an auditor like Chin Kwai Fatt investigating the PKFZ project, how can anyone accept the audit report as being the absolute truth? We have seen Chin Kwai Fatt rename and sell a company with 'sham directors', just to hide the contingent liabilities in PricewaterhouseCoopers Consulting Sdn Bhd (464379-U). We have seen Chin Kwai Fatt hire a tainted auditor to audit the books for PricewaterhouseCoopers Consulting Sdn Bhd (464379-U). We have seen Chin Kwai Fatt sign a false declaration with regards to PricewaterhouseCoopers Consulting Sdn Bhd (464379-U). We have seen how Chin Kwai Fatt finds it totally acceptable to say that PricewaterhouseCoopers Consulting Sdn Bhd (464379-U) can meet its liabilities as and when they may fall due, when he does not even disclose the several hundred million Ringgit in contingent liabilities it has. He does this even when there is a sworn statement by the Chairman of PwC Malaysia, Dato Johan Raslan, that the Court of Appeal finds the plaintiffs claims against PricewaterhouseCoopers Consulting Sdn Bhd (464379-U) are not manifestly unsustainable, meaning that the chances for these contingent liabilities to fall due are there. We have seen how Chin Kwai Fatt has done all these and more. And now they want to trust an audit report he has had a major role in to investigate the PKFZ? Tun Dr Ling Liong Sik, innocent after all? As funny as that may seem, it is not a laughing matter. Someone somewhere must have a very sick sense of humour.